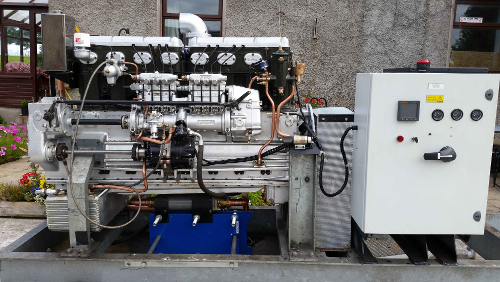 Above image shows 200KVA genset with integrated heat exchanger. Fuel economy, ease of maintenance and reliability dictate that the Gardner powered generators are ideal for use in marine applications or in remote areas where technical expertise is not available: outback farms, villages, research stations etc. A Gardner 6LXB for example will consume only 25.5 litres of fuel per hour delivering a continuous 121kVA. Life expectancy can be measured in decades! We can provide twin bearing, stand alone, naturally aspirated gensets to 200kVA. These can be supplied with modern instrumentation and control panels to customer specification.